I often hear that one of the reasons people are drawn to work in a Pregnancy Medical Clinic is the ability to share their faith openly without fear of retribution from their employer. Working in an environment that fosters, promotes, and encourages Christian values is definitely a positive experience, as I can attest to in working for Sparrow Solutions Group! I also often hear that people were not allowed to share or express their faith in the hospital or clinic setting, but now they can in the PMC clinical setting. Do the “standard rules” of hiding one’s faith not apply in the PMC setting? 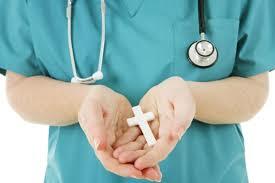 Is the ability to share or express your faith curtailed in a “regular” clinical setting? In other words, is the PMC setting unique because of this new freedom? It’s not revolutionary to anyone that faith is expressed in many forms. Faith is expressed in the way we speak to others, the things we talk about, our actions or non-actions. Someone may see our faith in the kind words we speak when the culture would expect harsh words instead. Maybe it takes the form of supererogatory actions (discussed in my last article). This kind of faith expression follows with what St. Francis of Assisi reportedly said, “Preach the gospel, and if necessary, use words.” Yes, you would all agree, this kind of faith can be expressed in any setting. But what I think people mean when they discuss the inability to express their faith is the verbal sharing specifically of their faith in Jesus in any medical setting. Am I able to share my faith in Jesus in any clinical setting, or is the PMC unique? The Guide to the Code of Ethics for Nurses develops this discussion of expressing one’s personal opinion in the form of sharing one’s faith by reinforcing this expression should not be pushed on someone who doesn’t want to hear it or should not take advantage of the vulnerability of a patient. We’ve all been a situation where something is pushed on us when not wanted or tied to a perceived benefit or prize. I think we would all agree that no one – especially Jesus—is served by this kind of proselytization by high pressure or baiting. Does the Bible agree that we should share our faith carefully? 1 Peter 3:15-16 (ESV) says, “but in your hearts honor Christ the Lord as holy, always being prepared to make a defense to anyone who asks you for a reason for the hope that is in you; yet do it with gentleness and respect, having a good conscience so that, when you are slandered, those who revile your good behavior in Christ may be put to shame.” Remembering that you do not have the power to save is a valuable exercise in faith in God’s sovereignty and grace. Relying on the Holy Spirit to lead you into conversations that meet the patient where they are and reflect the loving grace of Jesus. I’ve learned that I can share my faith in any clinical setting if done with gentleness and respect. Although I still agree that working in a pervasively Christian environment is a beautiful thing, it’s not strictly because I’m not allowed to share my faith in other clinical environments. I’m also thankful to work for an organization that fully embraces sharing Jesus in all environments and communities.